Videogame music is, as we and many others have argued, absolutely vital to what makes particular experiences memorable and special. It's no surprise, either, that there are a lot of musicians in the world that readily cite gaming as a core passion in their lives — whether in the retro or modern era, games have the power to inspire with their music. 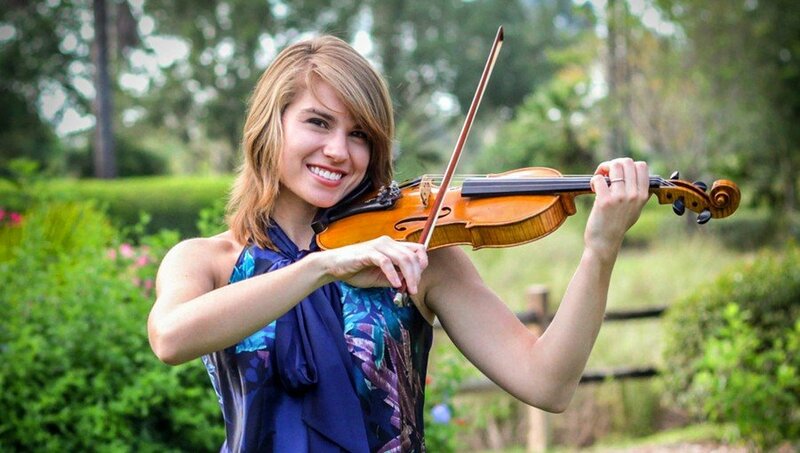 One musician that shows her gaming passion in her work is Taylor Davis, who has released multiple albums and accumulated hundreds of thousands of followers on her YouTube channel. 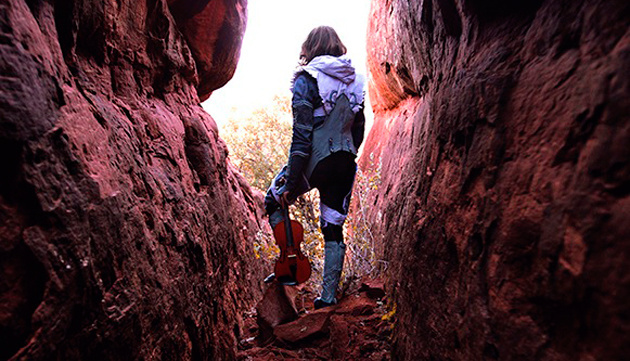 She's come to the attention of Nintendo gamers, in particular, for her stirring performances of music from The Legend of Zelda, though her inspiration from games is broad and varied. We caught up with Taylor to learn more about her background and sources of inspiration. To begin we'd love to know a little bit about your musical and gaming roots. Have you always been passionate about both activities? Yes! I’ve actually been gaming longer than I’ve been playing music (and I started playing the violin around 8 years old). I feel so grateful that I’m able to put two of my passions together for my career, it’s really a dream come true! What are your earliest gaming memories? I have an older brother so I credit him with getting me into gaming at an early age. In my earliest gaming memories I remember playing a computer game called Gorillas and Frogger on Intellivision. How long have you been playing music and when did you turn professional? I’ve been playing the violin for about 19 years. I’ve been playing professionally for the past 4 years now but wasn’t able to turn it into a full time career until 2 and a half years ago. Why did you choose the violin over other instruments? I have a really vivid memory from when I was in an elementary school Christmas assembly watching a young girl perform Silent Night, and I just remember being so enthralled by her playing that I ran home after it was over and begged my parents to let me take lessons and thankfully they agreed. I had never really been interested in playing an instrument before that so I feel like it was meant to be! Currently you have released five albums into the world. Can you tell us about these? All of my albums except for Game On: 2 Player Mode have fully orchestrated backtracks with violin solos. I completely arranged, produced, orchestrated and recorded my first 2 albums by myself, co-arranged and produced with Lara de Wit for Game On: 2 Player Mode, then worked with Adam Gubman who arranged, orchestrated and produced for my most recent 2 albums. I couldn’t afford to hire anyone to help with my first few albums so I learned how to create the backtracks myself. I’m fairly slow at putting together backtracks, and the quality isn’t on the same level as when I work with Adam so I’m extremely happy that I can afford to work with him now because I feel like my most recent albums keep getting better and better as a result of our partnership. Gaming Fantasy is my first album and it’s a mixture of my favorite video game and anime music. An Enchanted Christmas is a collection of my favorite Christmas songs. Game On: 2 Player Mode is the album I made with Lara de Wit and is a mixture of video game and anime music. Legendary Movie Music is a collection of my favorite movie music ranging from classic to modern movies. 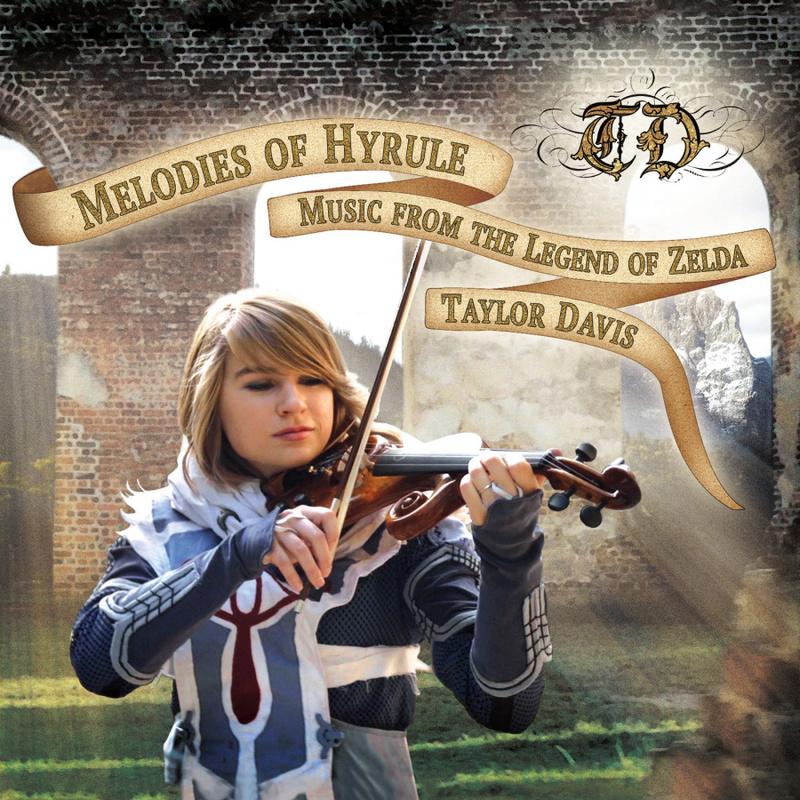 Melodies of Hyrule: Music From “The Legend of Zelda” is a collection of my favorite music from the Zelda series. There’s a lot of Ocarina of Time music featured in this album and that’s because Ocarina of Time is one of my all time favorite games. In addition to videogame music, you also seem to have a fondness for movie soundtracks. What qualities do you look for in a soundtrack when choosing music to cover? Generally whenever I cover a song I want to have some sort of emotional connection with it. When I cover video game songs I usually choose songs from games that I’ve played because then it’s really easy to have an emotional connection with the music. With movie soundtracks I like to choose songs from my favorite movies, especially if they had any special impact on me. I’m a huge geek so a lot of my favorite movies fit into the fantasy, sci-fi or action-adventure categories. Melodies of Hyrule saw you cover music from Zelda games. Can you outline why you chose the franchise for a project on its own, and outline your favourite tracks? I originally had planned to release a Zelda mini-album of about 7 or 8 songs just to see how my audience would react to an album based off of one series since I’ve never done that before. When I started putting together a song list, I quickly came up with over 15 songs that I really wanted to cover, and I know how huge the Zelda fan base is so I decided to put together a full length album instead of a mini one. I got in contact with my friend and producer Adam Gubman to work on the album with me and I’m incredibly happy with how it turned out. I honestly like all of the tracks for different reasons, but if I had to choose favorites I’d say Bolero of Fire and Gerudo Valley. In 2013’s Game On: 2 Player Mode you collaborated with a fellow violinist Lara de Wit. How easily did you work together as you are based in America and Lara in Australia? When we collaborate on videos it’s actually fairly simple since we can just do everything online, but when we decided to do an album together we knew that it would be pretty hard to do that completely online, so we actually split the cost of a plane ticket and Lara flew over to the US to stay at my house for about 2 weeks to work on the album. 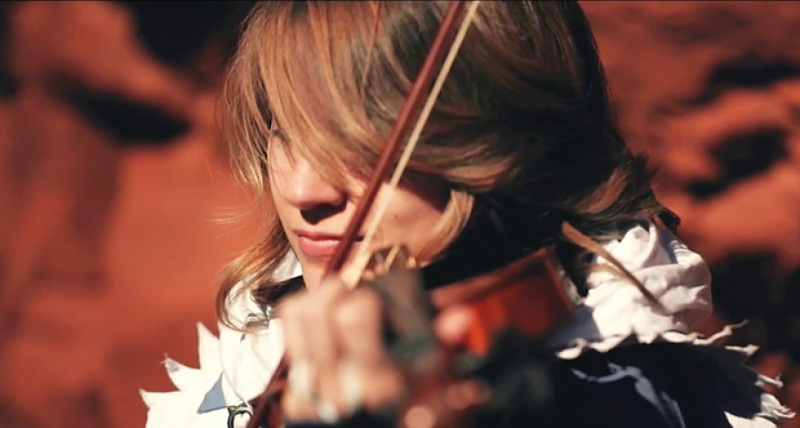 Lara plays both violin and piano but piano is her main instrument so that’s what she recorded for the album. We created our arrangements together and recorded all her piano parts and made her edits before she left. Then after she left I finished up by recording my violin parts over her final piano parts, and we sent edits back and forth to get the final versions that we used for our album. Lara is an amazing musician and a really easy person to work with so it was a great experience. Your videos have great production values; we especially liked your recent Bolero of Fire cover. Can you tell us a bit about the work which went into choosing a location, the outfit and the cinematography? Thanks a lot! Now that I’m more established in my career I can thankfully afford to invest in higher quality productions. I was looking into locations to do videos for Gerudo Valley, Bolero of Fire and Disney’s Circle of Life all in one trip to save on travel costs, and my friend Adam Gubman who produced the Zelda album with me suggested I look into Sedona, Arizona. As soon as I saw some pictures online I knew we needed to film there because the scenery fit each song so well! For the Bolero of Fire video I was cosplaying as Sheik because I just love her costume so much and I think she’s such a great character, especially when cool female video game characters are hard to come by! This was the same Sheik costume that I had worn in my previous Song of Time and Song of Storms video a few months before. I borrowed the Sheik costume from an awesome cosplayer and costume designer named Seifer-Sama, and I also hired her to make my costume for my Gerudo Valley video. The cinematography was all done by FifGen Films. They’re an amazing group and I’ve worked with them on a lot of other videos in the past. 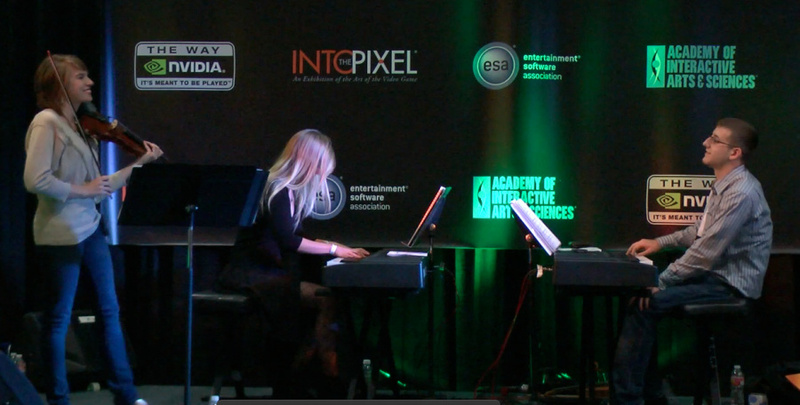 What can you say about the process of adapting a videogame piece for one of your albums? It depends on a number of different factors, but mostly if I’m working alone or working with a producer. I used to have to do everything alone and basically my process was just to sit down and listen to the original soundtrack and put together an orchestration by ear on my computer using a midi keyboard and different sample instruments. Now that I’m able to afford to hire a team for production I feel like that is by far the best investment I can make for my music. I now work with an amazing composer/arranger/producer, Adam Gubman, and I use him as much as I can for my orchestrations and arrangements. When I have a new idea for an album I’ll send him the track list I’ve put together and we’ll talk about each song and how we want to style it and also what kind of overall feel we want the album to have and then we’ll go from there. Adam comes up with incredible arrangements and I usually don’t have many notes to send back to him once I hear the first drafts because I’m just so excited to go record my violin part! I still do all my own recording from my house because over the years I’ve been able to find a sound I really like and I wouldn’t see much of a cost benefit of going to an outside studio at this point. How do you go about making one of your “performance video” productions and arrangements, from start to finish? Has this evolved over time? My process has definitely evolved pretty drastically over time. When I first started posting videos I literally had to do everything myself and all I could afford to do was record myself on a cheap video camera and tripod in a spare room and use the camera’s internal microphone for audio. When my audience started to grow I really wanted to improve my production quality, so I would upgrade my equipment whenever I had the chance. I started recording my audio through an external microphone which made a huge difference in my audio quality, and then eventually I purchased an upgraded camera and video editing software and tried some more ambitious videos that my friends and family filmed for me. Eventually it got to the point where I could justify reinvesting some of my album revenue into professional videos and I started hiring professionals like Landon Donoho and FifGen Films to film and edit my really high quality videos. Since I can’t afford to do those videos every time I upload, I still sometimes film by myself but I’ve been able to purchase a few different backdrops and lighting kits so my at home videos look a lot more professional than they used to. Which one of your arrangements has given you most personal satisfaction to produce to date, and why? My Journey Medley will definitely always hold a special place in my heart. I created the arrangement and backtrack myself because this was still before I had any resources to hire producers, and I’m really proud of how it turned out. The music is absolutely gorgeous and even though I usually have a hard time listening to my own arrangements, I actually love listening to the Journey Medley. While I was putting together my arrangement I got in touch with the actual composer of the soundtrack, Austin Wintory, and he was incredibly supportive and excited about the arrangement and video! We became friends as a result and recently Austin had me perform the violin solos for the soundtrack he composed for game “The Banner Saga”, and that was an amazing experience. This was also the first song I released a truly professional video for and Landon Donoho did an amazing job with the cinematography and effects. I honestly had no idea that this would turn into what it has. I originally started posting as a way to keep music relevant in my life after I graduated college and started working a desk job. I didn’t know that it could turn into a full time job and I’m seriously so grateful that I’m able to do this as my full time career now. Thank you so much to my supporters!! Is producing these videos now your main job, and if so what did you do before? I’m very happy to say that I’m a full time musician, and producing videos definitely takes up a lot of my time but beyond that I also do a lot of other things to make up my career. I’m always working on new albums, I sometimes do session musician work for soundtracks and songs, I perform at various events, I recently started performing my own live shows and have more of those lined up for this fall, and I also recently joined a video game rock band called “Critical Hit” and have a number of shows lined up with them for later this year as well. I really love what I’m doing and hope to get involved in even more projects in the future because I really enjoy trying new things with my music. Before I was a full time musician I was working at a non-profit organization as their marketing/PR administrator. I think that the classic video game soundtracks relied more heavily on creating memorable melodies because the production quality was so different and composers back then didn’t have the same resources available to them, largely because of technological limitations. A lot of modern games now feature soundtracks recorded with live orchestras and there are thousands of different sample instruments and effects to choose from when composing, so I think that modern composers are able to get a little more creative and sometimes that leads to more ambient music that maybe isn’t as memorable but still fits the game really well. I love the memorable melodies from classic games, but there are also amazing modern game soundtracks as well and it’s so awesome to now play games to music that is so high quality. Which composers inspire you the most and why? There’s a really long list of composers that inspire me, but someone who really stands out is Nobuo Uematsu. His music has had a huge influence on me over the years. The Final Fantasy series is my favorite game series (FFVII is my favorite game of all time) and I just remember being so completely in love with the soundtracks to those games every time I played them. When I was younger, the only place I could find the soundtracks was on Ebay, so I would order them from random sellers in Japan and then make mixed CDs of my favorite tracks from each game. People definitely thought it was strange that I would do that with video game soundtracks, but those were my favorite CDs! I have reached out to a number of other YouTubers with similar music styles to see if they’d be interested in collaborating but it has to be the right fit for both parties involved. It’s usually harder to put together a collaboration than a solo video mainly because of scheduling issues and the difficulties of arranging online instead of in-person, so that’s why I generally don’t collaborate too often. I do have some collaborations planned for later this year that I’m really excited about though, and I’m always open to considering working with other YouTubers if it works for both of us! I love the memorable melodies from classic games, but there are also amazing modern game soundtracks as well and it’s so awesome to now play games to music that is so high quality. I’ve actually never relied on ad revenue for a living because due to copyright issues I’m not actually able to monetize many of my videos. Even though some of my videos have millions of views, I don’t make any money from them because I can’t safely monetize them without risking a copyright strike. YouTube has made some major changes recently though and now I’m actually able to monetize videos with Content ID claims as long as I created all of the audio in the video myself and am not using an OST backtrack. Only a handful of my videos have been claimed though so right now I’m only making a few hundred dollars a month on ad revenue, but I’m hoping that will increase as YouTube makes more changes because I’d love to put this extra revenue back into my production and do professional videos more often. I almost completely rely on album and single sales right now for my living, and I also recently joined Patreon and I’m really grateful for the people supporting me in those ways because that’s how I’m able to keep doing what I’m doing! Can you tell us a bit more about why Patreon is such a vital channel for you? What benefits can patreons get? Do you feel this is a better platform for you due to the recurring “tips” than a Kickstarter model, for example? Yes Patreon is amazing and has had a really great impact on my ability to create higher quality videos more often. Patreon allows fans to essentially donate a fixed amount of money each time I upload a new video to my YouTube channel. The professional videos are very expensive and what I’m currently receiving on Patreon doesn’t quite cover half of the expenses for a professional video, but it’s incredibly helpful and their support has allowed me to feel comfortable investing in those types of videos on a more regular basis knowing that the entire cost isn’t all on me. Depending on the level of support, my Patrons get access to a special news feed where I post a lot of exclusive content like behind the scenes pictures, live performance announcements, upcoming album and video project information, etc. Sometimes I ask my Patrons to choose between 2 songs for me to do a video for if I’m on the fence about it. I also offer a once a month live video chat and I really look forward to those every month because it’s really fun to let them get to know me on a more personal level and it also provides me a way to get to know my Patrons a little bit better too. I’m so grateful to my Patrons and with how anonymous the internet can sometimes be, it’s really awesome that I can now actually see who my biggest supporters are. I think Patreon is perfect for YouTubers or anyone who posts free content on a regular basis, whereas I think the Kickstarter model is better for a single project like funding an album or maybe a really ambitious video or something like that. If someone wants to buy a high quality version of your music, where is the best place to look? Loudr.fm is a great site for both artists and supporters. Prices are the same or sometimes cheaper than on other sites like iTunes, but supporters are able to choose between a number of different file types including lossless formats. Another bonus is the fact that artists get to keep 85% of the earnings from their sales as opposed to 70% on the other major sites like iTunes/Amazon/Google, plus Loudr includes a copyright licensing service to license cover songs. Here’s a link to my artist page on Loudr. You can also get physical albums from my website. What are your future plans? Will you stick with videogame covers or do something completely different for your next album? I’ll be releasing a new album in July that will be a mixture of video game and anime music. After that I plan to launch a Kickstarter for an album of my own original music. I love doing covers, but I also want to get some more of my original music out there and hopefully people will enjoy it! I’m also trying to put on more of my own live shows later this year in different cities across the US, and in the future I would absolutely love the opportunity to visit more of the world with my live shows. It’s definitely a work in progress but if enough of my fans keep coming out to my live shows then I’ll eventually be able to expand to more cities. You have talked previously about difficult experiences with bullying in your past, perhaps related to your hobbies of music and gaming when growing up. Do you feel you’ve drawn on this as a positive in adult life to drive your current success, and is there a message you’d like to share with others that are victims of bullying? As much as it was difficult to deal with at the time, I’m actually really grateful for the years that I dealt with bullying. Once I was able to start ignoring the negativity, I became a lot more independent and introspective because I stopped caring about what other people thought of me and focused on how I felt about myself. It helped me find real value in the people and activities that made me happy in life and to stop caring about the people who made fun of who I was and what I liked to do, and that was an incredibly empowering feeling. I would say to other victims of bullying please just focus on what you love about yourself and what makes you happy in life and just forget about the people who try and bring you down. Life is too short and we all have a limited amount of time and energy to spend every day, and life is just so much better when you spend it on the people and activities that you love. When you do that you take the power away from the bullies and give it back to yourself. I really hope that I’ll be able to continue working as a musician for the rest of my life. I honestly feel so blessed for what I’m doing with my career right now because I’m able to combine so many of my different passions and I can honestly say that I love what I’m doing. It’s such a gift to do something that you love for a living, so my dream is to just continue loving what I’m doing and share that with the world. There are a lot of areas that I want to expand and a lot of new things that I want to try and I’m really excited for what the future holds. And I just want to again thank all of my fans and supporters because I would not be doing this without you and I’m so grateful that you are helping me live out my dreams! Thanks to Taylor for taking the time to speak to us. Cool interview. Gaming and music are my favorite things and I also listen to game soundtracks regularly. It's sometimes funny to listen to some NES tunes in a crowded bus or something but hey, what can you do? I need my Batman The videogame tunes or I get cranky. Oh, I love Taylor's stuff! Taylor Davis, Lindsey Sterling, and Kate Covington are like my holy trinity of Youtube musicians. Final Fantasy 7 is her favorite game of all time? I just replayed FFVII to make sure I did't remember it wrong. Nope. Truly, the first of the sub par FFs. After 8, 11, 12, 13 and 14, I'm surprised Square would continue making such mediocre games. Even X is fairly overrated and further demerited by its atrocious sequel. One and two were decent introductions to the series, two in particular built toward quite the epic. Three through six are four of the best RPGs of all time. I'd say it's the series the best compares chronologically to console Zelda (NES, SNES, N64, GC, Wii). One and two were pretty good. Three, four, five and six were great. Seven was overrated. Eight was lauded by the romanticists but really, fell short in the end. Mostly due to linearity, excessive cutscenes, forced romanticism, inane combat and poorly structured characters. In fact, eight was EXACTLY the same for both games. I don't mind Taylor's stuff, but it's hard to take her seriously sometimes. That and she's basically pigeonholed herself by doing so much gaming music. And even though gaming music is diverse and varied, her selections are not. Good thing she's kinda cute.. I bought her Zelda album the last time you guys posted an article about her and it is definitely among the music I listen to the most. She is incredibly talented and I wish her the best of luck in her career advancements gaming and otherwise. Great interview! I really hope she gets even further with her awesome musical talents. I, in a way, can relate. Video game music is actually what got me into playing the piano in the 7th grade, and from there, I learned as much as I could by just using internet videos and midis. I really hope to make a career out of something I love as well, and music is just one of them! I'm definitely not an amazing musician myself, but I know I'll get there with enough knowledge and practice. "Once I was able to start ignoring the negativity, I became a lot more independent and introspective because I stopped caring about what other people thought of me and focused on how I felt about myself. It helped me find real value in the people and activities that made me happy in life and to stop caring about the people who made fun of who I was and what I liked to do, and that was an incredibly empowering feeling...please just focus on what you love about yourself and what makes you happy in life and just forget about the people who try and bring you down." I love this paragraph! Bullying is part of what made me who I am. I'm thankful that I've gone through it so often, because I now know what's best to think of myself. It's why I'm always so serious about that kind of stuff and why I don't let it step a foot in the presence of those I care for. Just bought Zelda album. Love Zelda and the violin. Love her rendition of Gerudo Valley! She is so awesome! I love the interviews you guys put up. Keep em coming. @NodesforNoids you just had too have a giant rant that talks about, Why she likes that game huh. not everyone is going to like your favorite games man get over it. Super cool and talented young woman! Really cool, she's great. Didn't know about her till now so thanks NintendoLife. It's really cool that she's doing what she loves to do and making people happy. Video games in general have some of the best music so it's definetly cool she's doing a lot of video game stuff.